We are experts in old furniture removal, old appliance removal, attic clean outs, junk pick up. Our service also includes the recycling of items that can hurt our environment, rest assured that if we are on the job we will be efficient and green friendly when it comes to this matter. Hoarding is a severe mental illness that left untreated can severely impact someone’s life and the lives of everyone around them. Compulsive hoarding is behavior hallmarked by collecting a large number of items that appear to have little or no value, and a failure to throw out items even when they are broken, damaged, or useless. A person who suffers from untreated hoarding is a threat to themselves and a threat to property. Prolonged compulsive hoarding can create conditions in a house or apartment that are extremely unsanitary and dangerous. A house or apartment filled with junk also becomes a massive fire hazard. It is almost commonplace to switch on the news and hear reports of a hoarder that has died, trapped underneath an avalanche of junk, or a house that has burnt to the ground because it was stuffed with junk. Treatment is key when it comes to hoarding. Green Clean Junk Removal Services provides a part of that treatment puzzle with our hoarder junk removal services. Our experienced and compassionate junk removal experts know how to deal with hoarders and compulsive hoarding. Green Clean Junk Removal Services provides a way for someone with a compulsive hoarding disorder to regain control of their lives by reducing or eliminating the amount of junk in their homes. 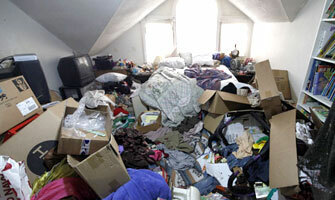 Green Clean Junk Removal Services can also help landlords who have had to recently evict a hoarder clean up. Our Hoarder Junk Removal is based on helpful knowledge and actions to help you clear out junk that has been piling up for years. The best Junk Removal services can be provided by our crew and will not disappoint with our on time and professional care we offer to all our Junk Removal clients. Our crew is very hardworking and professional and can provide you with the best service in the area. Let our Junk Removal professionals take your that junk out of your hands and into the dumpster where it belongs. Our crew will remove any and all objects in order to clean up your property. We are experts in old furniture removal, old appliance removal, general trash removal services, attic clean outs, junk pick up. Our service also includes the recycling of items that can hurt our environment, rest assured that if we are on the job we will be efficient and green friendly when it comes to this matter. Green Clean Junk Removal Services offers hoarder junk removal services to Los Angele, San Diego, Riverside, Santa Barbara, Ventura County, and Orange County. We also offer hoarder junk removal services to New York City and most of New York State.